Tank is looking great as always. Where did you get that Barclaya Longifolia? Its been at the top of my wish list for a while but I've yet to see it available anywhere. Greggz and Bartohog like this. I got mine from @Immortal1 (Thanks Linn!). Don't know if he has more available yet? @burr740 sometimes has some, and I am pretty sure @Bartohog here usually has it as well. And that's another good example of having patience and how plants sometimes take a while to transition. When I got it from Linn, it pretty much lost all of it's leaves in a few weeks. I left the bare bulb planted which sat there for a month or more. Then suddenly it came to life, and is a good solid grower now. Good luck and hope you find some. Bartohog, Immortal1 and tredford like this. Just discovered this deal and also ordered one. That wifi power strip you are using is on sale for mid $40's price on Amazon. I figured some on here may not want to pass up on one too, so wasn't really sure where else to share this info since @Greggz already has one. Make sure to also click on the 20% off at checkout button/coupon too! Shows as $55, but takes another $12 off this way. Update to the update... Maybe it's just me, but I can't seem to purchase a second one. Seems to show in stock, but limited quantities open for purchase. Starting phasing in lower dosing on Dec. 1st, basically 25% less of everything. Started second phase on Jan 26th, cutting another 25%, so 50% off everything from most of last year. KH down from a little over 4 to about 1 or so. Been at the same dosing for 6 weeks now, except for a little bump in K in the last two weeks. So pretty settled and thinking this is the new normal. Do not see myself going back to my previous levels, unless something unforeseen develops. The little bump in K seems to have stimulated a little more growth. Still nothing like before, but I am thinking now that is a good thing. You can see the Limno Rugosa starting to fill in the spot just left of the Pogo K. It replaced the Ambulia, and I already don't miss trimming it every week. It was a true weed. The Rotala Macrandra Caterpillar I got from Burr is turning into a really nice thick bush. It's right of the Pogo K and replaced the Myrio Red Stem. Same thing, don't miss trimming the Myrio every week, another 1+ inch a day grower. I moved the L. Atlantis I got from @Immortal1 to right in front of the L. Rubin. Starting to show some nice color now, and I think it is going to be a good one. Really only one loser, and that would be Cabomba Furcata. Burr had similar experience, and attributed it to the lower micros. I put what little is left up front, but I think it is going to be a goner soon. So all in all, I think I'm to the point where in my mind the last four months has gone from a risky experiment to a new way of doing things. rzn7z7, chayos00, burr740 and 6 others like this. Wow that Pantanel is looking good - I really need to try that one of these days. So, what is your Macro dosing levels these days? Just lowered mine again to 14/6/17 NPK - as odd as it sounds to me, it looks like most of the plants actually look healthier now. My micro dosing is pretty much the same as in the dosing thread - yours? Here you go Linn. Includes the slight bump of K.
I've been keeping Pantanal for quite a long time now. And while it can be moody, in general it has always been a good grower. I'm all for trying what are considered "difficult" plants. Sometimes it turns out they are not that difficult after all. burr740 and Ken Keating1 like this. Interesting, at 50% water change your N/P/K is not much different than mine. Also my CA is now basically the same as yours. The other odd thing I noticed this weekend - my degassed pH is lower (was 7.6-7.9, now its about 7.2). On Saturday I adjusted the controller down a bit from 6.3 cut off to 6.1. Fish didn't care one bit. Uh oh another one exploring the HCL KH drop! Looks like a new frontier is being forged. As you are seeing, when using a pH controller, you need to keep a close eye on any changes in KH/pH. That's one of the reasons I went to RO water. My well water KH was always high, but it did fluctuate quite a bit seasonally. I like having it be rock steady. One less thing for me to worry about. And I am very, very curious to see where this HCL dosing goes. Should be very, very interesting. Immortal1 and Ken Keating1 like this. I moved the L. Atlantis I got from @Immortal1 to right in front of the L. Rubin. Really only one loser, and that would be Cabomba Furcata. I almost accidentally sold the Atlantis it looks exactly like the rubin I am already growing. If differences are seen please post about it. Furcata for me was never quite right. Grown in an inert and soil capped substrate. Top 4-5 nodes were beautiful and everything below that slowly rotted away. Never rooted as did the green and purple varieties. I thought about this over a year ago and decided to just slowly bring it down via the RODI water route. Now everyone has me thinking of the quick route, go figure! Maybe I dose and drop .5dKH per week until I hit 1dKH or less? Of course all of this talk starts after I have no more acid left @ home! Etched the floor in the basement before I laid all of the tile 6 years ago, WTH! Greggz, Immortal1 and Ken Keating1 like this. Size and shape of Atlantis is very similar to Rubin. However, the colors are very different. You can see it in the FTS above as the Atlantis is in front of the Rubin. While Rubin is a monotone deep red, the Atlantis has hints of yellow, orange, pink. Will get a good shot of it and post it. It also seems to twist a bit more, not the straight up growth of the Rubin. Now the Furcata was very happy for some time, and I really liked it. Like I said, Joe thought it was related to micros, and I buy that. But I am not going to chase it. Goes back to finding species that like the soup you are serving. Here's when it was happier. Grew like a weed then too. Now just slowly wasting away. burr740, Immortal1 and Ken Keating1 like this. LRJ, Maryland Guppy, Immortal1 and 1 others like this. Looks like the L. Atlantis survived the transition to your water just fine! Really a good looking plant pic and as you stated, there are subtle differences in color. There is an older pic in my build thread in post 677 that might give a little more color definition. 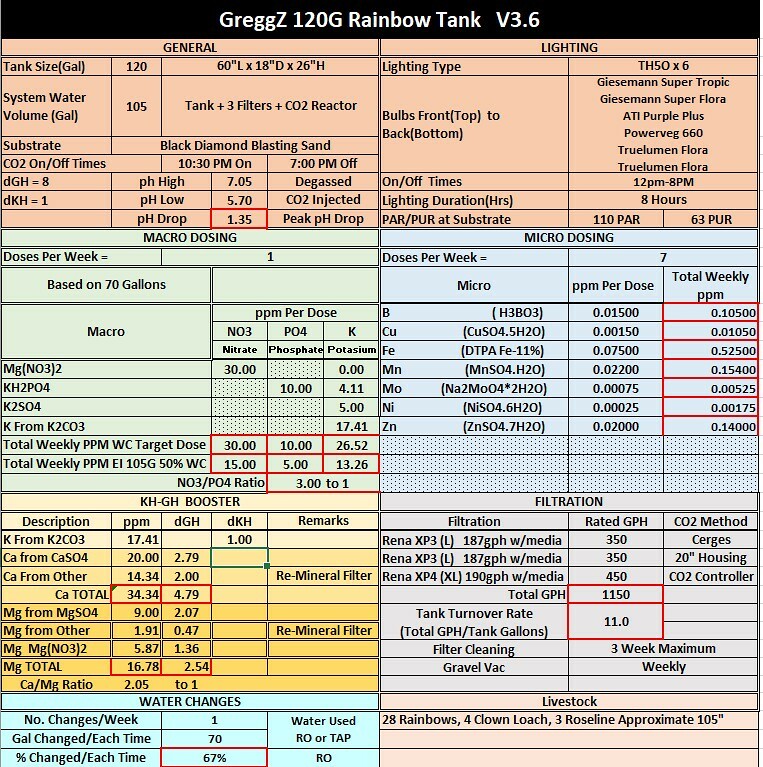 Gregg, would be interested in your thoughts with regards to lower kH/pH and the well being of Rainbows. Lowest I have taken my pH is 6.3 and they don't seem to be bothered. I don't think I am ready to plunge into the HCl arena yet - still working on lower macros with positive results. All I can do is relay my own experience. My KH as been at about 1.0 with pH 7.05 for 15 weeks now. Dropping pH to 5.70 during the lighting period. Have not noticed any difference at all. If anything, might be a positive response to lower macros, as colors seem even more intense. Behavior is the same, feeding time is normal (always hungry!! ), spar and flash daily, no sickness, so personally I am not concerned with KH/PH level affecting the rainbows at all. Immortal1 and OreoP like this. "Always hungry" LOL thats a fact!